Brilliantly colorful cutouts are used to teach colors and shapes in this board book designed with artwork by Henri Matisse. 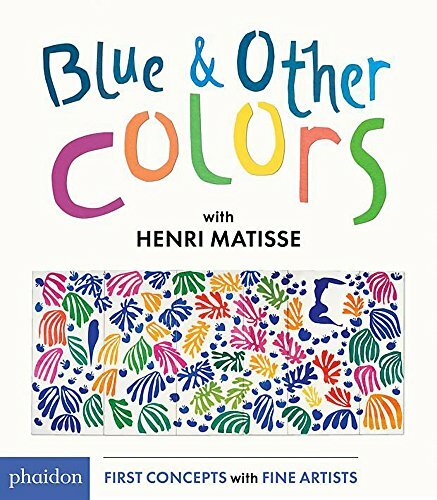 Blue and Other Colors takes children through Matisse's color palette by showing his various collages. From simple ones to more complex ones each page focuses on certain colors. Though the book doesn't focus on shapes, it could have. Matisse uses various abstract shapes in his cutouts in which many are randomly set. The author also focuses on the color blue, yet the book does feature various other colors. Matisse tries to use various shapes, depth, and scale to his cutouts, but many seem very elementary. Children will be able to relate to this simplicity trying to duplicate his work. The text is straightforward, easy for young children ages one to three years old to be able to listen to and repeat. The information about Matisse that is found in the back of the book will interest young readers, though many will not understand his cutout technique. Using gouache paint and various sized scissors to create his effects Matisse really tried to create something different in the later part of his life when his mobility began to fail him. The cutouts in each collage are relatable to children and parents will appreciate the information and visuals as well.